I eagerly await your opinions and analysis on the samples. Also the links for the Gorillaz and Black Eyed Peas samples are all kinds of messed up. I don't have time for a full analysis, but I did just do a quickie frequency response comparison of the Aja samples. Read this graph like a graphical equalizer. Window length is 300ms, overlap is 66%, Blackman-Harris window, L+R and L-R channels (black is L+R, ie the mono signal, red is L-R aka stereo). Off the cuff, the bass boost is pretty shocking, to the point that I'm not exactly sure if it could even be caused by a tonearm resonance problem - it might be a mastering change on the LP. It's around 30db@50hz ish. I'd need a far longer sample (like several minutes) to be sure one way or another. (PM me if you're interested in that sort of thing.) The rising L-R response at the upper treble is probably going to be tracing distortion. I'd guess the drop around 200hz and the generally attenuated L-R signal is a mastering change, but that's always hard to gauge. Hey: I looked at one of your close-up pics and that reminded me. While you're at it, could you also be sure to clean the stylus with a Magic Eraser before each play, if you can? Just lightly press the Eraser to the stylus in an up/down motion to get all the gunk off. It's the cleaning method du jour nowadays and it's pretty cheap. It really can improve some of the results. If you don't have a ME then a useful alternative is a Q-Tip soaked in rubbing alcohol, but you have to be sure not to get the cantilever too wet as it can wick up to the suspension, and some stylus adhesives do not like getting wet (but that's usually a problem with the high-end carts more than the entry-level ones). Q-tips were too scary for me for stylus cleaning back in the day. I used to use a small, closely-packed brush pad, dosed with alcohol, that I could run the stylus through (like moving a spike through tall grass). I think it was made by the same folks who made the Discwasher fluid...I remember it has a classy wooden handle. Bad news, krab... they're already level-matched. I apologize for not double checking the links. It was approaching midnight as I was wrapping up the post. They are fixed now so listen away! Off the cuff, the bass boost is pretty shocking, to the point that I'm not exactly sure if it could even be caused by a tonearm resonance problem - it might be a mastering change on the LP. It's around 30db@50hz ish. That was my impression too just by listening to the Gorillaz LP sample vs. the CD. These should be the same masters since the album was put out in 2005. I will PM you the link to the full Steely Dan song since I know you own both the CD and LP. Hey: I looked at one of your close-up pics and that reminded me. While you're at it, could you also be sure to clean the stylus with a Magic Eraser before each play, if you can? Yes, I noticed that piece of debris when looking at the close-up of the cartridge. It's not there anymore. I will take your suggestion and pick up a ME marker and apply it before each play. ...amazing how much gunk it could pick up from just one play, depending on the disc. These are all new LPs, so there should be minimal gunk. That reminds me, though, I still have one more music sample- a dusty, scratched Fleetwood Mac LP. I won't touch the stylus to this record until I finish the test LP tracks. The original plan was to keep match the levels as best as possible. Then I discovered that the USB turntables I'm testing don't allow me to set the levels! I could normalize after the fact but I don't want to give the impression that the samples have been tampered with. I only own Aja on LP, not CD. On The Run is a better sample for me. 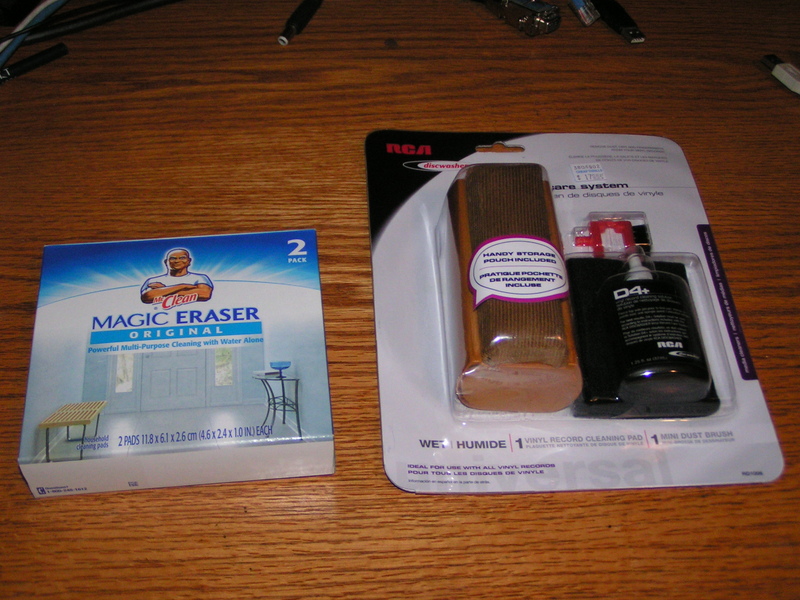 Magic Eraser is a sponge, not a marker - it's going to be in the cleaning aisle. Don't normalize - I can normalize the plots myself so that the response at 1khz is set to 0db. Well ultimately, that's OK -- I have the CD, not the LP. It's not unusual for LP versions to be mastered differently than CD versions. Even if the same master tape was fed into the cutting process, EQ can be applied during cutting (and then if that EQ'd feed is saved, that become the 'LP production master' for subsequent cuttings). Or two masters may be made from the mixdown master -- one for modern CD (e.g. highly dynamically compressed) and one for LP. 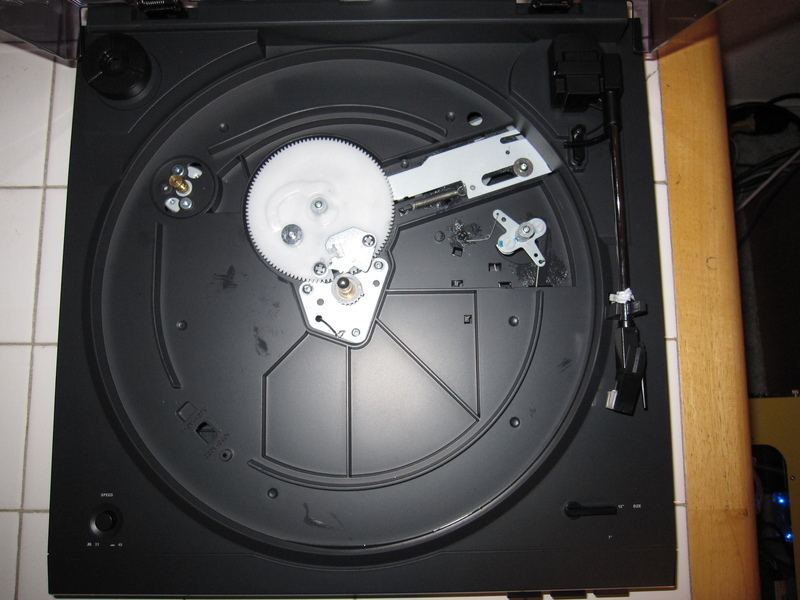 Vinylphiles IME commonly recommend a thorough vaccuum/clean of even brand-new LPs. Maybe it's just one of their rituals, but isn't there supposed to be some kind of 'releasing agent' on new LPs (artifact of the stamping process)? That's OK, if I want to I can apply replaygain at the playback end, without altering the actual data. Between 1k-9k the response rolls off by 6-9db. This is a huge, huge difference. The response at 20k is about 15-20db below at 1k. Not as bad, but still crummy in the grand scheme of things. The Pink Floyd needledrop has a large noise peak at 19khz, but it doesn't exist in the Steely Dan recording. So it might be cut into the record. Probably not audible to begin with. 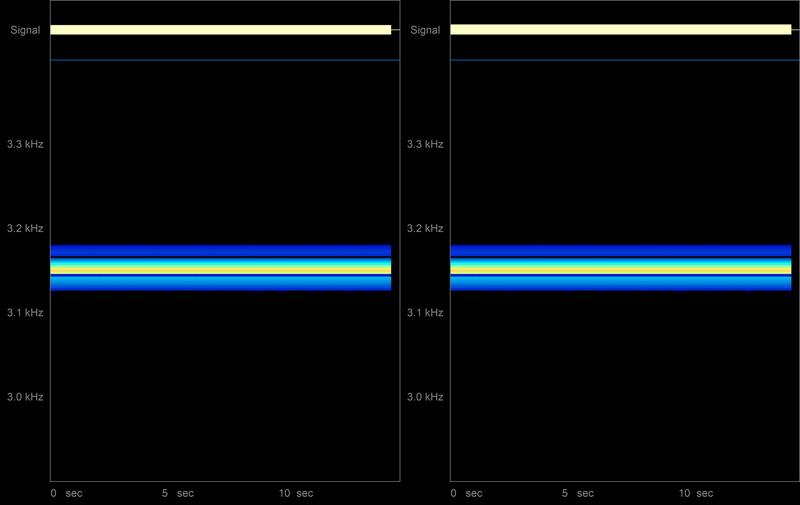 Large (5db) response discontinuity in both tracks at 9.5khz, probably a resonance of some kind? Maybe in the cartridge? Probably audible. It's hard to derive any more from these plots without probably equivalent masters and/or the test record sweeps. Plus, I've already spent way too much time on this on a weekday. The plots look really ragged overall, but it's hard to gauge how much of this is the turntable and how much of it is the mastering, especially with the raggedness goes in opposite directions for different records. 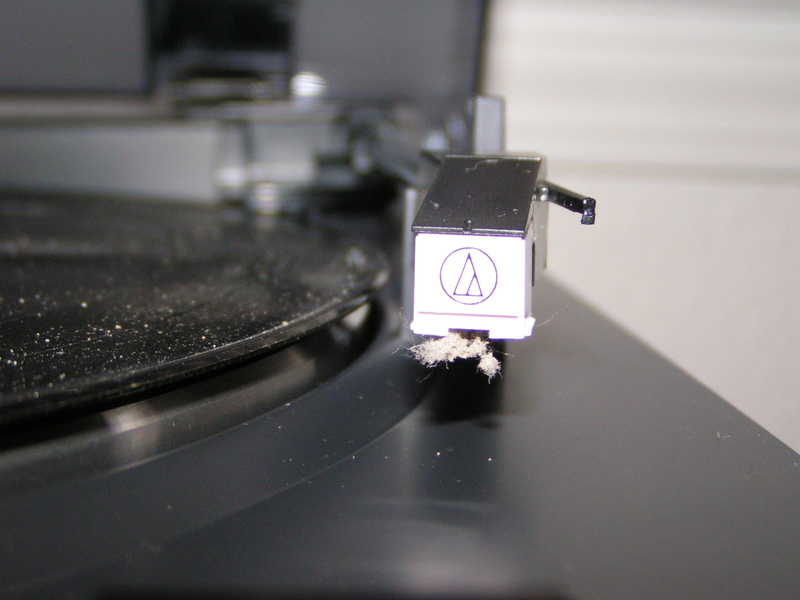 .Vinylphiles IME commonly recommend a thorough vaccuum/clean of even brand-new LPs. Maybe it's just one of their rituals, but isn't there supposed to be some kind of 'releasing agent' on new LPs (artifact of the stamping process)? Mold release agents are generally added to the vinyl formulation directly, and I remember a quote (Stan Ricker?) that actually spraying MRA onto the presses almost never happens. That said, there are lots of stories nowadays about brand-new record with chaff and crap inside the seal. I'd also like to point out that even though an analysis of the frequency sweeps is going to give an authoritative picture of the frequency response of the turntable, the analyses of the recorded music show things that may not appear on the frequency sweeps, such as the impact of stylus shape on the response. They can help explain what you hear on the vinyl, while the sweeps are much less direct in their interpretation. However, it's important not to read too deeply into it. Excessive distortion may only show up as heightened treble response, and may mask potentially unrelated (but major) linear distortion issues. A certain amount of interpretation is always required. Yeah I was confused. nm. You can tell how much cleaning I do around the house. When I brought a couple boxes home, the wife tells me we already have a bunch of boxes in the garage! 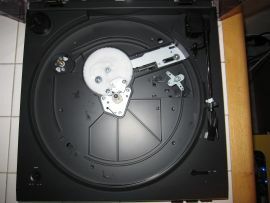 Vinylphiles IME commonly recommend a thorough vacuum/clean of even brand-new LPs. I seem to have misplaced the LP attachment to my vacuum cleaner. Seriously, though, I looked around at acquiring vacuum system. I'm not a handy person, so the DIY route is not a viable option. 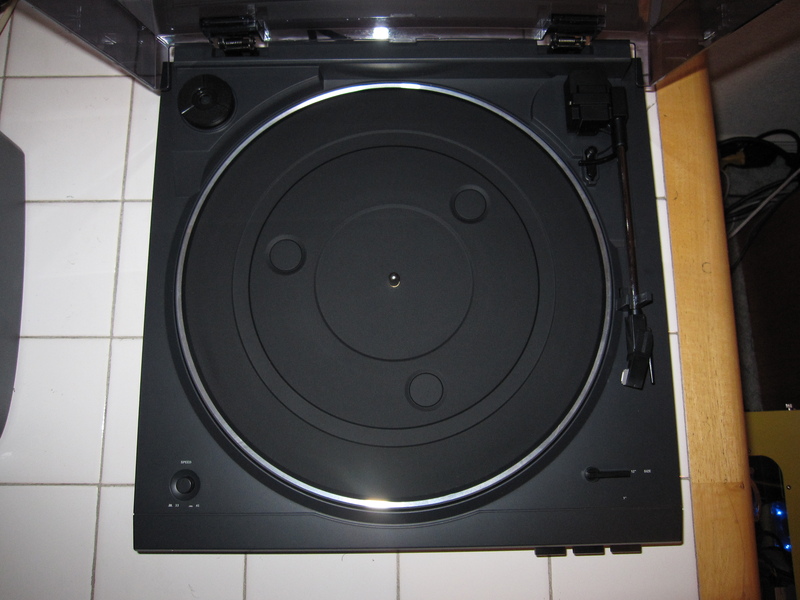 Buying an assembled system means forgoing another USB turntable or two. 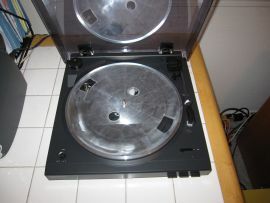 I did pick up the old, reliable Discwasher system, though. I'll clean the test LP, ME the stylus and then post another sample of the silent groove. The graphs look great. Thanks for that. It's hard to derive any more from these plots without probably equivalent masters and/or the test record sweeps. I'm working on test record samples after this post. That brings up a good question: Which specific tracks make for the best samples? You can read the track list and details for Ultimate and Hi-Fi News are online. Will that do it or are there any other important tracks? Are there any I shouldn't bother with? Take that sh*t back and surreptitiously suggest to your wife that y'all really, really need a $30 pressurized steam cleaner from Walgreens. 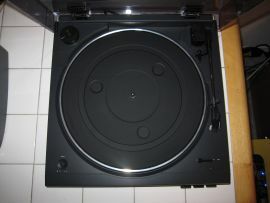 Look on several other vinyl forums (Audiogon, Audio Circles, Vinyl Asylum etc) on suggestions on how to use it. Combine that with some decent quality microfiber cloths and you'll probably have RCM-quality cleaning right there, just with some more legwork. Without spending any money on vinyl-specific equipment, too! Use a $10 carbon fiber brush to clean off superficial dust. [/blockquote]Will that do it or are there any other important tracks? Are there any I shouldn't bother with? First of all, IMHO, don't clean the test records unless you can see specific issues with them that require cleaning. You're putting a lot of trust into the cleaner to not negatively affect the test record results, and there are several (admittedly theoretical and unobserved) ways that can happen. Brush scratches record, dirt embedded in brush scratches record, dirt in brush is left on record, cleaning agent leaves residue on record, cleaning agent + brush moves the dirt around without picking it up, etc. For most other records, there is a good enough potential benefit of reduced noise that cleaning makes sense, but most test records are very well manufactured and maintained, and are also more expensive. That said, it's not the end of the world if you clean the records - no results are compromised - but if we hear a hiss in one of the channels on the silent bands and varies based on the position of the record, I'm going to wonder. Second, just post the entire needledrops of Ultimate and HFNRR. I can use almost all of the former and most of the latter. 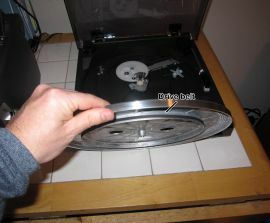 And when you're done with all the tables, please re-record each test record with the first turntable you played it on, to establish how much the results changed as a result of all the plays. Good thing you were online and stopped me before I did anything stupid! For the record, I did clean Side A of DSOTM. It was the most crackly of the bunch and I wanted to see if it would make a difference. It sounds exactly the same. The crackles and pops are still there. Since all the records I'm using in this test are brand new, I will refrain from cleaning any of them and continue simply handling them carefully. I'll touch the Magic Eraser to the stylus a few times before each needledrop. Second, just post the entire needledrops of Ultimate and HFNRR. I can use almost all of the former and most of the latter. Will do, with a caveat: We talking about a half GB or more in FLAC files. I will have to monitor my server's bandwidth usage closely. If it becomes too popular, I may need to make it available on a per request basis (you PM me, I'll give you the URL). Though based on the downloads I've made available so far, we're a long way from that happening. And when you're done with all the tables, please re-record each test record with the first turntable you played it on, to establish how much the results changed as a result of all the plays. Don't deal with the server - put up a tracker on Pirate Bay and I'll download it from there. Mods, put the guns down! IANAL, but I couldn't imagine that test record transcriptions would be considered a copyright infringement. They are absolutely not a substitute for the original article, you are adding vast amounts of information by transcribing it on your turntable, it only adds to the demand for test records by defining a larger market for their analysis, etc. BitTorrent is absolutely the correct distribution system for this sort of thing. The Ultimate Test LP FLACs are up. See the original post. The Hi-Fi News is proving to be a bit trickier. A circular groove follows each track. 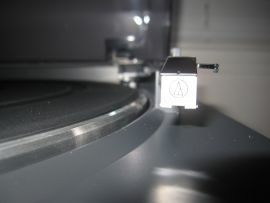 It forces me to lift the tonearm and scoot it slightly toward the center of the album before I can play the next track. So, when you hear hard breaks in the two HFN FLACs, that's why. These files are much smaller than my guesstimate for two reasons: The entire album is only 21 minutes and most tracks contain very little audio data- often just a test tone. Side A is 37.2MB and side B is 49.4MB. Enjoy! I expect to have HFN up sometime tomorrow. 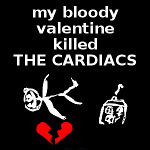 Yeah that was a sucky mastering decision with HFNRR that's been discussed here before. Generally the amount of content on a test record is far less than on a real record to maximize sound quality and make it easier to position the needle on the bands. I'm downloading the Ultimate FLACs now but I can't promise anything earlier than late next week for results. I'm swamped. I ran the Wow & Flutter test tone through Spectrogram and it exceeded my expectations in revealing deviations from the 3,150Hz test tone. Or maybe I underestimated just how unsteady the Audio-Technica turntable's playback would be. Either way, I got some great captures! Click to zoom in. I created the test tone in Audacity and I believe it matches the Ultimate Test LP tone exactly. 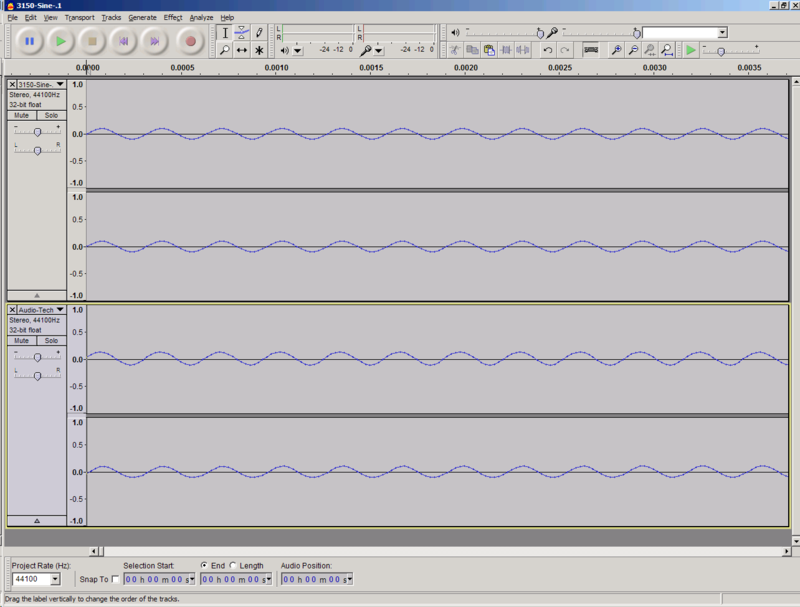 The amplitude is .1 in Audacity's units, -90dB in everyone else's. Here's an extremely close zoom of each tone in Audacity. Audio-Technica is on the bottom. I'm looking forward to comparing this spectrogram to the Ion TTUSB05 and the Crosley. Audio-Technica lists their Wow & Flutter spec (<0.25% WRMS). The other two manufacturers don't list it at all. Will I need to expand the range beyond 500Hz? We'll see! Those are pretty, but they're not remotely resolving enough. 99% of that wave might be due to the pressing being off-center - that will be easy to spot if all the other turntables show the same thing. 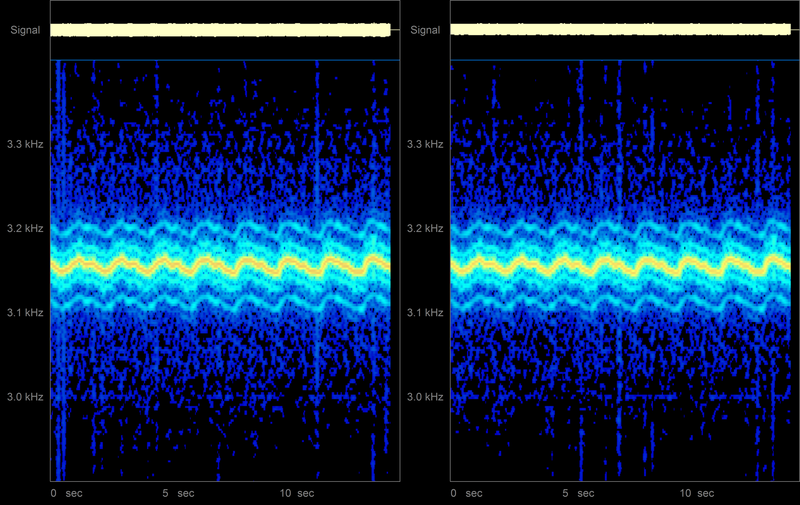 Most of the width of the spectrogram is due to FM sidebands which distract from the carrier wave. Measurable flutter (that we care about) can extend well into the 200-300hz range and beyond. Your frequency and time resolution should both be at least a hundred times more greater to get useful results, and that level of detail is simply impossible with spectrograms. The reference for interpreting wow/flutter is Poul Ladegaard's legendary 1977 paper on mechanical resonances. Specifically look at Fig. 18 on page 7. Those are the sorts of charts you ought to be displaying/interpreting. The "right" thing to do here is demodulation of the 3150hz tone into a wow/flutter signal followed by DC removal and amplitude spectrum. Don't spend much time playing with the spectrograms for any kind of analytical use - they're good for visualization but not for analysis. I've been meaning to cook up a good quadrature demodulation program for some time, and now is the perfect time. The Hi-Fi News FLACs are up. Those are pretty, but they're not remotely resolving enough....Your frequency and time resolution should both be at least a hundred times more greater to get useful results, and that level of detail is simply impossible with spectrograms. It's never as simple as I hope! This is quickly getting beyond my limited aptitude for signal analysis. It's really interesting reading, though. I've been meaning to cook up a good quadrature demodulation program for some time, and now is the perfect time. As always, thanks for your contributions and guidance. I couldn't have done it without you. The last sample is up: Fleetwood Mac's Rhiannon from an abused LP. The cut starts with a skip. We'll see how well the other two turntables handle it. The sample ends during the fade-out to help make the clicks and pops more apparent.